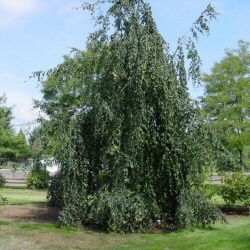 The Weeping beech is a good choice for a specimen tree in the larger garden and lives to over 150 years. You could try it in a small garden but you may need lube as it is a medium to large deciduous tree that has a majestic crown with large, pendulous branches which can cascade to ground level. Likely to grow wider than it is tall but could also grow upright, with foliage so dense, the main trunk is obscured. Some branches that reach the ground may take root so if this is not appealing, prune back to above ground level. Expect the weeping effect to not be immediately apparent as it needs to grow up before weeping. Some leaves maybe retained by the Weeping Beech over the winter period although these will be brown and shriveled. These are pushed off in Spring. Beech nuts are appealing to wildlife (the furry flying kind, not those on restricted movements imposed by the magistrate) and are edible, apparently tasting a bit like vanilla. The RHS saw fit to award the Weeping Beech tree with an Award Of Garden Merit. This means the tree is particularly outstanding compared to similar trees or someone at the RHS took a bribe. This could involve turning up late at night on an allotment somewhere, welly boots checked for listening devices, flat caps searched for cameras and a brief case full of Werthers Originals passed over. Weeping Beech is a very attractive tree, so much so that it does not require make up or any enhancements from a tree surgeon and is a popular choice for parks. An excellent present to buy for the older recipient as they have a lot in common. Stiff limbs, neither listen to radio 1 anymore, fall to pieces in the winter, a lot of time spent hunched over, put them in a good spot and they never leave. As with most weeping trees, you can determine final height by allowing the tree to grow to the height you require and then cut the main trunk/stem. This tree is supplied at a height of between 1.5 and 2.4 metres in a 5-15 litre container for year round planting and better survival rates than from bare-root stock. The range is large due to weather, time of purchase and age. Sometimes we have an excess of last years stock and will sell them at the same price. Expect a final height of around 20m on average. You can plant Common Beech trees in most locations including those containing chalk and exposed sites but no good for coastal sites. No Beech by the Beach! Best results come from black mailing an expert to take care of your tree for you, failing that well draining soil and full sun is the next best alternative. Feel free to plant anywhere warmer than minus twenty degrees centigrade. Be sure to water well if planting in warm weather as dry soil inhibits establishment. The Common Weeping Beech tree prefers to be left alone when it comes to pruning. Restrict your hacking of limbs to dead, diseased or crossing over of branches or those touching the ground if you do not want them to root. As our systems are already maximised to be as efficient as possible we can only suggest time savings are made on your end. We suggest reading fast, typing quickly and changing your perception of time e.g. don't look at clocks and keep yourself busy. Writing a glowing testimonial for us in anticipation could help? Our customers are so happy with their purchase, they must have forgotten to tell us. If we can pry them away from their purchase, we will chase them for a testimonial.